Coats is quoting the story Reuters reported that came up before, in which Brennan said the CIA had "inside control" over an "underwear bomb" plot in Yemen. The Reuters report says: "Brennan's comment appears unintentionally to have helped lead to disclosure of the secret at the heart of a joint U.S.-British-Saudi undercover counter-terrorism operation." So far, GOP Senators more concerned about leaks than president's power to kill US citizens w/out judicial review. That's Senator Mark Udall, Democrat of Colorado. Here's a press release from CODEPINK saying that eight of their activists were arrested after being taken out of the Brennan hearing earlier, four of whom had recently returned from visiting drone victims in Pakistan. Udall says release of Senate interrogation report will create a stronger CIA. Up now: Senator Marco Rubio, Republican of Florida. Brennan aggressively pushing back against Rubio. Arguing CIA should not hold detainees. In Rubio exchange, Brennan coming across well. He's making the case - and taking the stand - his boss should. Brennan is handling this line of questioning from Rubio well - seemed well prepared to argue why the CIA should not hold detainees. Brennan to Rubio. "Senator, this country needs to make sure we are setting an example and a standard for the world." Brennan to Rubio: "The CIA by statute does not have any detention authority." Brennan: The US has to "respect the rights of these govts to enforce their laws independently." No prisoners shld be held "extrajudicially." Best exchange of day. Kudos to Brennan for defending the rule of law. Sen. Collins asking if administration has adopted a de facto kill not capture policy. Brennan says he's unaware of any instance when there was an opportunity to capture a terrorist but a strike was carried out instead. Brennan: there "has never been an occasion" when the admin chose kill over capture. Senator Collins points to a New America Foundation study showing that there were four times the number of targeted killings under Obama administration than eight years under Bush. Winding down. Collins, other senators given five minutes each to ask their questions after Feinstein announces the classified portion of the hearings on Brennan's nomination will be held on Tuesday. Brennan responds to Sen. Collins: "We have to be very mindful of what the reaction is [to targeted killings] ... but what we have in fact found is that the people are being held hostage to al Qaeda in these areas and have welcomed the work the U.S. government has done to rid them of the al Qaeda cancer that exists." Sen. Heinrich (D-NM) asks if all agencies should be governed by Army Field Manual on interrogations, Brennan agrees for military but specifies that FBI has its own guidelines. Brennan: CIA is "insular" and has not "interacted" with the rest of the govt. CIA should "empower" rest of the govt. President Barack Obama's nominee for CIA director, John Brennan, said on Thursday he did not try to stop waterboarding, an interrogation technique that some consider torture, as he faced tough congressional questioning on that issue, security leaks and the use of drones to kill U.S. terrorism suspects. King, agreeing with Feinstein, calls for FISA like court to review any killing of US citizen. Brennan argues courts are difft from "battlefield." Exec branch must take action to prevent "taking of American lives." Brennan is wrong. King quotes Hamdi decision "a state of war is not a blank check for the president when it comes to the rights of US citizens." Feinstein suggests that because Awlaki was "not upstanding" he is no longer a U.S citizen. Hard to parse Brennan as he closed King's line of questioning by stating that all Americans are entitled to due process and rights by dint of their citizenship, yet he defends "last resort" use of strikes to prevent loss of life. Question time about Anwar al-Awlaki, the U.S. citizen killed in Yemen in 2011. Feinstein suggests that if your fellow Americans are "no longer proud of you," you no longer have rights. 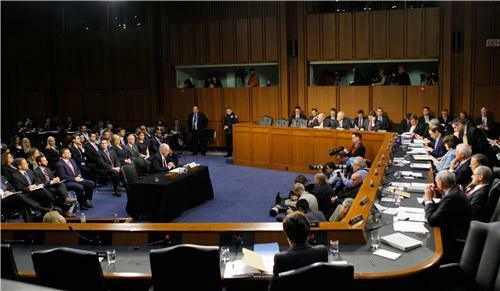 Senator Chambliss (R-GA) turns questioning to Benghazi. Chambliss, turning to Osama bin Laden, asks Brennan if he knew whether any of the information that led to bin Laden's discovery and killing came from EIT. Brennan says he doesn't know. At least two members of the Senate intelligence committee - Rockefeller and Chambliss - have already announced they won't seek re-election. Burr: "I'm going to be brief, because I noticed you're on your fourth glass of water, and I don't want to be accused of waterboarding you!" Sen. Burr jokes that he doesn't to be accused of "waterboarding" Brennan. Feinstein says "that's a good one." 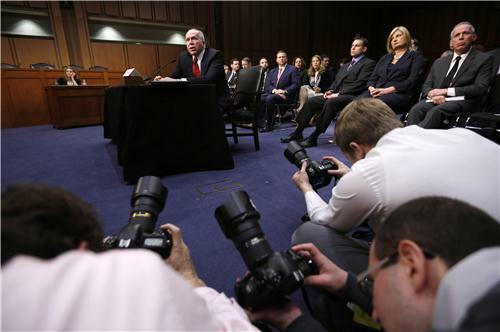 Brennan: Senate report on EIT "calls into a question" a "lot of the information" he received at CIA in past. Wyden suggests the president should give Americans the oppty to surrender before being killed by a US drone. 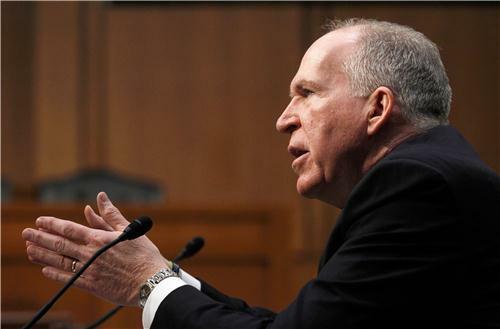 Brennan argues that anyone who joins Al Qaeda should know they are "an enemy"